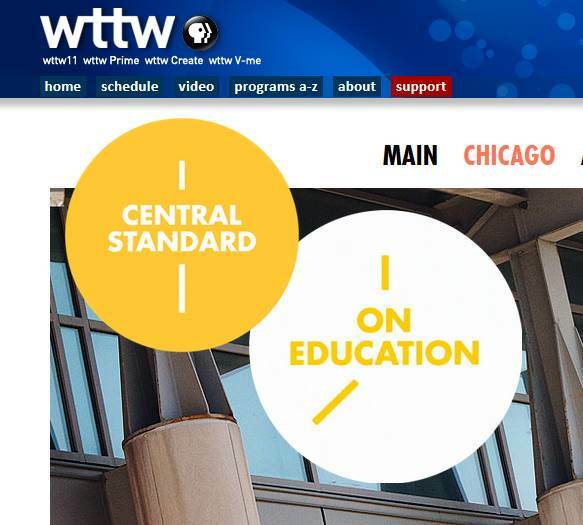 I’ve been meaning to post this for a while – WTTW has done a nice web series on the SE enrollment process, following 5 kids from different elementary schools through the process. The episodes are a nice length – 15-18 minutes each, so it’s easy viewing. Most of us know about the process already so that part won’t be as newsworthy, but the fascinating part is getting a glimpse at some of these schools (both elementary and high school.) I’ve noted a few episodes that are particularly interesting and some quotes/thoughts on them. This was really my first time seeing the Disney pods! charter schools, a turnaround school, and some of the SE High schools. UNO – I’m sorry, I can’t get past the principal phrasing everything like it’s a question? I haven’t watched through the end yet to see what happens with the kids. If you comment, please remember that these are real kids/families, so no judgy comments about them. OK, I’m going to point out some facts to make people feel better about CPS, given some of the issues discussed in this doc series. First, let me preface this by saying (like I always do) that the “achievement gap” between non-Asian minority/low-income kids and Asian/white and non-low-income kids is the root of so many of the problems we have in this country for K12, which is sadly also the case with CPS. I’m not igoring non-Asian minority kids (I have some myself) and low-income kids here, it’s just that I think when comparing Chicago to the suburbs, we need to compare the same groups, given how huge the achievement gap sadly is. So how does CPS do, comparing white kids in the suburbs and non-low-income kids? One interesting fact which may surprise some people is that, according to IIRC.com (which is the data from the state, and official stats, etx.) K-8 schools in Wimette do not spend much more than CPS: for Wilmette, instructional expenditures per student were (2012-13 year) $8,230, perational expenditures $13,606. For CPS, it’s $8,376 and $13,433. Now, HS is totally different, as NTHS spends huge amounts per student, much more than CPS. When we look at ISAT scores, comparing white kids and non-low (NLI) income kids, CPS does pretty well with this “same” group. What’s more, when we compare Wilmette Middle School ro some CPS schools, many CPS ones do really, really well by comparison. One of my old neighbors was a pincipal in a public elementary in Glencoe, I remember talking with the other parent. When Glencoe parents found out that the principal’s family was sending their kids to CPS, they were sometimes amazed that they’d sent her kids to “city schools,” given the perceptiona that they’re all failure factories and schools in all the New Trier feeder suburbs are superior in all ways on every level, to pretty much every others anywhere, much les Chicago (!!). I can vouch for this from casual discussions I’ve had with people from these places, I always have to bite my lip, as some are kida’ smug in their conviction that their kids are getting a better education than anybody else’s (i.e., mine). So, look at Glencoe SD 35: W kids: 39/47/13/0, 37/54/8/2, 45/52/5/1, NLI kids: 41/47/11/1, 37/54/7/1, 44/53/3/1. At the CPS school my neighbors’ kids attended, kids in their same demographic were achieving higher than kids in Glencoe. What’s more, CPS W and NLI kids do better than similiar kids in places like Niles, Mt. Prospect, Skokie, etc –places where many Chicago families move for the schools –look it up on IIRC.com. Obviously, if we looked at RGCs (and the schools they’re attached to in many cases -Bell, Coonley,etc), Classical schools, etc., we’de get the same impressive comparisons for CPS. I know this is “a little too much information,” but it’s these kinds of facts that kept my family in Chicago and in CPS instead of nicely “integrated” suburbs with “good schools.” Even in those places (Evanston, Oak Park), despite higher spending, perceptionas about the quality of schools, a culture promoting intellectual development, etc., the gap between black kids (like mine) and white and Asian kids was HUGE (depressingly so). It makes many people think twice. So, yes, CPS has lots of room for improvement, can always use more money, etc., but many times it does as good a job or better than places where people escape to “for better schools” when comparing the same/similar groups of kids. The above stats also relate to the issue of people being extremely defensive about the changing of CPS school boundaries, etc., If people bought into a neighborhood with the understanding that their kids will go to, say, Lincoln, and then some people want to suddenly send their kids to a school that’s a failure-factory (e.g. Manierre) who can blame them for being upset? I can’t. Not really. People cling to their neighborhood school (Burley, Edgebrook, Blaine, Coonley, Bell, etc) when it’s a “good” one and if there’s too much sudden boundary changes, disruptions in terms of plans people made, etc., people will just give up and move to Wilmette, River Forest or wherever. I know that’s what my family will/would do. Same with many others I know. So, I guess my point is that this is good news, but it also explains why people are (rightfully so, IMHO) defensive when some people want to just up and move their kids from a high-performing school to a less-perfoming school, because they don’t like an annex, etc People are (and should be) mother bear-like in their interest over what kind of school their kids are going to –mess with that and you’ll get some angry people. Wow! Thank you so much, klm, for all of the info. It has definitely changed my perspective. I agree~We couldn’t have asked for a better neighborhood school. Comparing suburban schools (north and west where my friends’ kids attend), ours is the same or better in what they offer. I wished that this documentary would have covered a ‘real’ neighborhood school. The only one covered was a turnaround. I think at my kids’ school, 12-15 kids got into SEHS of their choice. My child is exactly where an ackie is to start 9th grade except in English bc our neighborhood school didn’t offer Survey Lit.. Also, bc of our World Language program, my child would have started Honors 2 in World Language but decided to do Latin. When people have a good school, they do cling to it. UNO teachers were so strict and didn’t seem pleasant at all. I was surprised since they have the best Math program~I thought she’d try and make it fun. The principal was very data driven, but I wonder if this is a true representation. May be she felt she had to be like that for the documentary. I liked Marquette except for “Zero” quiet in the halls. I’m very familiar w/Wilmette school and the Calumet City school. I thought those schools along w/Disney was portrayed accurately. I think the documentary really acknowledged ~ parents want what is best for their kids, to excel in their academic career, be productive citizens and have it better (easier for some, may be) than they did. Don’t think some suburban parents aren’t aware that some of the top schools in the state are in Chicago. That is why we have some Wilmette families testing their children for Chicago SEHS. At Payton you get 1st rate academics AND diversity, unlike New Trier. Some Buffalo Grove families test their kids for CPS SE options program because their districts have no gifted programs. Try enrolling your child at New Trier when you don’t have a district address at the time of enrollment. I talked to a staff member at a selective enrollment IB HS in Queens, and was told testing my child and applying were completely out of the question until we could show documents proving NYC residency. It is absurd that CPS still tests and enrolls students who live out of district while at the same time trying to expand decent HS and elementary options with new schools, additions, and IB. The city obviously does not need to do this to bring middle to upper class families to the city. This is not 1975. The shortage of seats worsened by testing and enrolling suburban students ends up driving middle class families out, in fact. Well, sure. They just have to read certain newspaper rankings, etc. I guess what I’m saying is some people in certain suburbs do seem to live in a certain kind of ill-informed “bubble” where Chicago Public Schools all means dysfunction, teacher strikes, an angry, very vocal CTU head hating on the mayor, gangs, public and very vocal fighting over improvements for crowded schools and closing of near-empty ones and corresponding “but, where’s mine?” griping, quasi-constant budget crises, etc.. –and then they compare all that to the schools where they live and count their blessings. Obviously, we all know that there’s more to CPS than negative stuff, but that’s the perception for lots of people, right or wrong. The misconceptions of CPS schools continue to exist, rightly or wrongly. I can’t tell you how many times a month I have to defend our decision to stay in the city. It’s a constant conversation and in all honesty, it’s starting to wear on me. Until CPS achieves a closer to balanced budget (not in this lifetime!) and classroom sizes for the more popular schools are more manageable (yeah, right! ), it’s very challenging for outsiders — and even insiders — to see the positives. klm, thanks for doing all the research. I am not surprised. But Chicago has a special problem. It’s not enough to have schools that do well with suburban-type kids. We have to do better, because many of our kids have to come from behind. We must steadily increase the percentage of students who leave school prepared for jobs or college. In general, people interested enough in education to frequent this blog will figure out how to find the good schools. But the kids without parents like you still deserve a good education. It means Chicago has to be better than, not just as good as, Wilmette. We can get there! However, how to go about this is the $10million question. I mean, look at schools like OPRF HS and Evanston Twp HS: they both spend lots more per student than Chicago (or most any other HS district in the state), offer awsome opportunities, incredible array of academuic classes (huge number of APs, art, music, etc), well-paid professional staff, extracurriculars, safe environments, kids come from safe, tidy, economically viable neighborhoods unlike the blighted war zones that many Chicago kids live in, etc –i.e., everything people want from CPS HSs, if only “there was the will to spend the money” like so many on this site and others are constantly saying. OPRF/ETHS spend just about as much as N.T. (or more in the case of ETHS in one measure: operational expenditure per student -$21,428 for ETHS vs. $20,423 for NTHS). Even in these high-spending, academically excellent, safe neighborhood schools, black kids are way, way behind their white peers. It’s truly depressing and upsetting to me. I mean, we are always hearing about how things would be different if CPS would just spent more money, kids didn’t have to deal with gangbangers on the way to/from school, etc. Well, these HSs have all the “wish list” stuff people want, but black kids are still lagging by a huge margin. Getting things to turn around for many minority and low-income kids in Chicago will require more than just spending more money. A final note: People whose kids go to NT rightfully feel like their kids are getting an awesome eduation –NT is considered by some to be the best open-enrollment HS in the country. However, note that the white kids at Evanston are scoring higher than even the white kids at NT. There’s a similar dynamic when looking at 3-8 ISATs comparing Evanston to Wilmette, Glencoe, et. al. Sometimes, it’s better look under the hood and carefully examine all the stats before making a choice of where to move/live in order to get one’s kids a good education. For example, with my family being bi-racial and my kids (both the homemade and adopted ones) black, we were really thinking seriously of moving to either Evanston or Oak Park/River Forest a while back. Then, we looked at the stats for black kids at the schools and were totally turned off. These are “good schools,” but relatively few black kids, for whatever reason, are doing really well. Accordingly, these were not “good” schools for us. Many CPS schools have lots more high-achieving black kids than suburban areas, which is another selling point for us. I know many families with black kids that do the same. The first thing they do is look a test scores for black kids, then they make informed decisions accordingly. In this way, CPS is actually a good choice sometimes, perhaps even better than many suburban areas with “good” schools –and with greater spending per student. And I know some people will be thinking: Why are you so obsessed with test results, don’t you know these are imperfect measures? Maybe, but looking at these kinds of disparities really is helpful for parents when deciding what school(s) are best for their kids, I believe. Some people don’t like measuring a school by how much its students are actually capable of achieving, but I think that they’re wrong. It matters. Some people cling to a Johnathon Kozal-type argument that it’s the “savage inequality” -type difference in spending b/t school discticts that explains most of the achievement gap. We’ve been hearing this over and over for decades. Look at the people protesting to keep Dyett open –their argument is that it would be a great school if only CPS gave it more money. From what I’ve discussed above, there’s more to it than that, IMHO. klm – great food for thought in your post. If the “white” and “black” descriptors were replaced with “mostly comfortable” and “mostly low income” respectively, would the discrepancy in performance still hold? is it about skin color or is it about family income? @10. Agree. I’m surprised klm focused on how well the black students do when vetting HSs. Assuming her criteria were how well a school does with students who start out educationally disadvantaged, I thought we would agree that poverty and parental education, and not skin color are the determinants. It does not appear that children of any color whose parents are financially comfortable and educated like klm would be educationally disadvantaged. Now if the point was to filter out HS school test stats attributable to having already high achieving students before they came to the school, then that makes sense. Unfortunately, the majority of black students are not high achieving, so she may be using that as an indicator of poverty and low parental educational achievement. The most reliable indicator of quality instruction at a high schools, it seem to me, are the ones at which real academic gains are made between freshman and senior year; a real increase in PLAN, EXPLORE, ACT scores. (And I consider these extremely limited indicators-no writing, little innovation required. )HSs schools that admit already high achieving students and then graduate them without showing much growth look good, but their 1st rate status is dubious. Do some CPS SEHSs fall into this category? It seems to me that there were some stats on this blog a few years ago showing that SEHS were not exactly doing a stellar job of making big academic gains for what are widely considered to be the systems most capable students. Also @9, maybe money spent on ‘wrap around’ services and interventions starting at birth for educationally at risk children are what’s needed. Head Start has worked. Many of the parents of these children need support, and expending resources solely on the children will not work. They are part of a famiy system. Single parents in poverty can be mentally stressed, worn out, discouraged, and exhausted, have low self esteem and know nothing to look forward to beyond smoking some weed or doing some blow. They need encouragement from someone who cares!!! And no, it will not always work, some cannot change. This is not a home climate where kids are looked in the eye and spoken to from birth, read to etc. There is so much good will out there among people who really want to help. Really. The most aggravating thing is that the people power and money is rarely marshalled and organized in such a way that a systematic collective impact is made. Call me pollyanna, naive, and hopelessly idealistic, but it can be done, if we make it a priority as a country. There is an achievement gap even for black kids who have college-educated parents, including those with professional degrees. I’m not just guessing here, there’ve been many, many studies, articles, etc. –Google it. Black kids with parents with college degrees do less well than even white kids from low-income families with less educated parents. I’m not making this up –it’s true (and very upsetting). I concentrated on black students because there are lots of them in Chicago and because, frankly, I have some myself in terms of offspring ( a little myopic, I know). Plus, when people think of “disadvantaged” in this country, usually what pops up in peoples’ minds is a black kid in the inner-city/ghetto/Southside/Westside, etc..
Bottom line: there’s an achievement gap even with black kids with parents that have good jobs and degrees, live in “nice” neighborhoods, come from high income households, etc. I wish that on IIRC.com we could get scores using both ethnicity and income as a cross reference, but we can’t. Given this, my point is that if there’s an “achievement gap” even with black kids from backgrounds like this (upper-middle-class, educated parents), then closing the achivement gap between low-income minority kids with less educated parents, etc., and white and Asian kids is a daunting problem, indeed. One statistic that has always horrified me, but yet is indicative of the problems we face as a nation in terms of maximizing human capital, is the fact that the average 8th grade black male reads no better than the average white female 4th grader —WTH?! Is it any wonder that the PSAE scores are so bad for black kids even in Evanston and Oak Park? What’s more, even when black kids have educated professionals as parents, live in nice neighborhoods, etc., there STILL is a huge achievment gap between them and even working-class white kids (per SAT scores, etc. ), never mind fellow upper-middle class kids that are white and Asian. It’s a real problem, not just for CPS, but for the entire country. @9 True the gap is higher in Evanston v. Chicago for black:white achievement, but the absolute performance level of black 11th graders in Evanston is higher than that of black 11th graders in Chicago. The same is true for low-income:non low-income. They do better in Evanston than in Chicago. This is consistent with Kozol’s thesis in Savage Inequalities. @10 Yes, but the magnitude is less for low income:non-low income in Chicago v. black:white in Chicago. Keep in mind that income is measured dichotomously when it is actually a continuous variable, so we lose some data there. 13. klm I wasn’t aware that the gap persists beyond income. I spent 8 years at a SEHS with two kids and attended all the parent open houses where parents meet their kids teachers at the beginning of each year. Although this school has a a significant contingent of African American, well-to-do, upper middle class parents very few non-white parents ever attended. It was basically an all white school on those evenings where it should have been about one third white. This was a well known phenomenon at the school and the administration was at a loss as to how to rectify it. Sure, if one’s comparing CPS v. Evanston as a whole. I’m suggesting that particular CPS schools seem to have more high- achieving black kids –I guess I should have been more particular in my wording. And, yes, I’m sure money helps (it often does), but it hasn’t prevented an enormous achievement gap in Evanston, so I’m still not sure that money alone will make a big difference, without some major changes that shape how kids learn, achieve, persevere, etc. This country is full of schools districts where per student spending is very high (Newark, Camden, DC, …) but where achievement is very low, even compared to the same demographic student population as elsewhere). I’m not saying that we shouldn’t spend more on education for at-risk students. However, if it’s not done effectively, it’ll just be the same failing model, but at a higher price. Sadly, sometimes that what I believe some people want: the same failing schools, but with more money to spend on effectively the same inadequate model. Comparing per student spending in Illinois, for example, there are many great, high-performing school districts that spend significantly less than CPS, but produce superior results (e.g., Naperville, virtually every small town in the state, etc). Now, I know these places don’t have the same challenges as Chicago, but it does show that not everywhere do the schools need high per-student spending to be really good. I’m not saying money’s not an issue, I just don’t believe that it’s THE issue, as has been the mantra of money people for decades. .
KLM, I was not aware the gap persist even when AA income is at parity with non minority, either. Does anyone know if the gap persists or if middle to upper income blacks do better when their teachers are mostly AA? Maybe receiving instruction from someone from the same culture has an impact? Also, I wonder is the number of generations away from poverty, low educational achievement impact the gap. If you are only 2nd generation college educated AA (your parents went to college), does that impact achievement. It seem it might. And how about how many generations you are from poverty? These would make interesting studies. Research has shown that the cultural and social capital a student inherits (related to, yet distinct from academic achievement) has a measurable impact on college success. All these factor are extremely complex. From first hand experience, I am first generation college degree (father some college, mother HS only). It definitely impacted the ease with which I navigated college, grad school and career options, even coming from an intact, lower middle class family. Arrrgh, just disregard that typo ridden post above. I need to quit posting from my phone. KLM, I was not aware the gap persists even when AA income is at parity with non minority, either. Does anyone know if the gap persists, or if middle to upper income blacks do better, when their teachers are mostly AA? Maybe receiving instruction from someone from the same culture has an impact? Also, I wonder, does the number of generations away from poverty, and generations away from low educational achievement impact the gap? If you are only 2nd generation college educated AA (your parents went to college), does that make high educational achievement less likely than those whose grandparents went to college?It seems it might. And how about how many generations you are from poverty? These would make interesting studies. Research has shown that the cultural and social capital a student inherits (related to, yet distinct from academic achievement) has a measurable impact on college success, and these would seem to be related to how many generations in a family has benefitted from economic security and the influence of educated parents..
Oh boy, I’m all about typos, given that I post from an old device w/o auto-correct, am usually holding a toddler with the other arm, etc., half of what I post here is one big typo. I think people are always trying to find a “magic bullet” for solving or at least largely reducing the problem of the achievement gap. Back when “self esteem” was all the rage a generation ago, the lack of self-esteem was to main reason non-Asian minority kids were often doing poorly in school, according to many. Well, we now know the obvious point: high self-esteem comes from success, not the other way around. Some people believe that the biggest issue is one of minority control of school boards, but that hasn’t helped many school districts. Some people think that the problem is that too minority kids are being taught by people not like them (namely white females). I heard an interview of Bobby Rush re: the violence in the Southside and what to do about it, etc. His first response to discuss how he just went to his grandkid’s CPS grade school graduation and how the teachers were largely white females, so …. (I’m not sure I believe that the reason some kids are shooting people is because their teachers are not the same gender and race, but that’s what he’s suggesting, and it’s something for Mr. Rush to easily hang his hat on. Personally, I believe crime is caused by criminals, not by the racial and gender makeup of the criminals’ K-12 teachers). Everthing that I ever read seems to indicate that the best thing for kids is to have an excellent, effective teacher. A white female that is an effective, excellent educator by definition is respectful of differences and is respectful of her students and of who they are. So, it doesn’t matter who’s teaching kids as long as they’re good teachers, IMHO. I’ve looked into studies re: race of teacher on same-race students. Apparently, just like one might suspect, it’s no magic bullet. Any positive correlation is weak at best. Not to mention employment laws. We can’t hire people according to their race or gender, unless there’s some kind of legal mechanism (settlement, judgment, consent decree, etc.) that was born of legally substantiated discrimination. I don’t think that happens at CPS in 2014, so I hope that the best candidates get hired, regardless of their race and/or gender. The problem that I find when trying to discuss or solve the issues with some struggling urban schools, the achievement gap, etc. is the idea that all these problems spring from somewhere else: Springfield, DC, Downtown Central Office, out-of-town companies that make guns, the mayor, the biased media, suburbanites’ indifference to urban issues, schools like NT that have more money per student, not enough same race faces in textbooks and in front of classrooms, adminstrastive offices, etc. Everything’s the fault of some “other” person or thing, so until things change, what can we really do? I’m not saying none of this matters, but the urban schools that are successful (and their are some ) stop blaming all their problems on things outside their control,roll up their sleeves and turn lemons into lemonade as best they can. That’s what good school everywhere do, for that matter. Bottom line: I don’t think anybody has a good fact-based answer re: many of the issues related to solving the achievement gap, but many people have strong opinions and turn speculation about their opinions into “facts” that aren’t really substantiated. Personally –and I’m sure I speak for most parents everywhere –I don’t care what race and gender my kids’ teachers are, as long as they’re “good” teachers. Thanks for posting! I was really enjoying videos and for sure will watch them over and over again. The only thing I wish to see is a “Parents” Episode where they would give more information on how their kids have got to straight As, especially in schools where a lot of kids doesn’t meet the state requirements. Anyway, wonderful series! @18 It is very hard to get cross-tabs on race by income (that is, data on race controlling for income and vice versa). And again, the severity of poverty is not captured by the usual student lunch v. non-student lunch dichotomy. A family of 4 qualifies for free student lunch if their annual income is $23,850 or less. Yes, you read that right. If you have a family of 4 (two parents, two children or one parent and three children) and earn $24,000, you only get reduced-price student lunch because you are not poor enough. However, for “free lunch” the FDA (per its web site) max for a family of 4 was $30,615 last (2013-14) academic year. For “reduced lunch” it was $43,568. In this era of low inflation, I’m sure there won’t be much difference next year. Don’t get me wrong –those are still WAY low income stats. It’s depressing. I grew up poor (food stamps, trailer park, the “projects”, store brand breakfast cereal in the bag [real Froot Loops in a box were for birthdays and Christmas morning], etc.). However, like so many people, I’ve lived so long in my Whole Foods Bubble here on the Northside –sometimes it’s easy to forget how tough things are out there for so many (TOO many) people. I really enjoyed this series. I began watching it several weeks ago when it was discusses on WBEZ. One thing I think that the series does show is that, even when one doesn’t get into cetain SEHSs, there are other options –charter schools, etc. I know that the charter schools seem a little too military-like in terms of rules, behavior, etc., but some students and many parents like this sense of “order,” given all the problems going on in some neighborhoods, given the pervasive sense that too often “disorder” reigns. There are options other than “failure factory” schools, but people have to care enough to do something about it. All the kids in the series were lucky to have good parents and a certain amount of personal motivation, but too many kids have parents for whom “doing great in school” simply means not having to repeat a grade. I suspect as the fiscal situation of suburban districts decline overall their academic standing will also decline. When comparing CPS to all other LEAs it terms of fiscal resources it is first important to note that Wilmette Elementary School District 39 doesn’t have to pay teachers pensions out of its property tax base. TRS pensions are paid 100% by the state. So the total operating expenditures can be allocated in a much different way than in CPS. It should also be noted that Wilmette has two elementary school districts SD 39 and SD 37 which is smaller. SD 37 has much higher ISAT scores than SD 39. SD 37 also has a much higher instructional expenditure rate than SD 39 because those residents of Wilmette who live in the boundaries of SD 37 have a much higher EAV per student than SD 39. Here are the 2010 EAV per student: SD 37 $956,197, SD 39 $593,209. Just for a reference point the CPS EAV per student is $231,178. The data is really a bit more complex than Kim presented it. I do think it is excellent that Kim is thinking comparatively, it’s important to do that. But cheering for outcomes at specific CPS schools relative to an entire school district is really questionable. I do think that Kim’s larger point that middle class students in CPS can perform as well or better than students in higher income suburbs is valid, especially for white students. It is very difficult to make that determination for minority middle class students in other districts and within CPS. The data that is publicly available doesn’t provide that level of detail. At a school like Lincoln it is safe to assume the vast majority of white students are above the low income line, in some suburbs that is a safe assumption too. But it gets much more complex for minority students and it would require a deep dive into statistical analysis. I really enjoyed getting a look at the different schools and in general I thought the series was well produced as a program. I do think it either ignored or glossed over a lot of issues. It didn’t discuss tiers (at least in the episodes I saw). It didn’t really discuss the potential downsides of the SEHS system. In general, the students shown all had successful outcomes. Of the 4 CPS students shown, 3 got into his/her top choice SEHS and the other still got into an SEHS albeit not top choice. I know they showed the Disney kid’s friend who did not get in, but that was mostly in passing. Also, this is very subjective, but I didn’t get a full sense of the pressure from the process that I believe exists. Thanks for posting about the series, CPSO! All the kids were motivated, driven students and their great results proved it, no matter their backgrounds. I did think the Wilmette/New Trier storyline was a bit of the “odd man out” and it was evident in episode 9 when the interviewer was asking the kids about the pressures of applying to schools but the Wilmette student didn’t go through the same stressors or experiences. I also found it reaffirming that the kids from more disadvantaged circumstances or with English as a second language for their parents were able to rightfully (and in many cases by “rank”), earn a seat to these top Illinois schools. Plus, the counselors who stepped in to help them understand their choices were instrumental in changing their trajectory. As an aside, Westinghouse is definitely a “hidden gem” SEHS and lots of opportunities to be had there in a state of the art school. I recommend folks attend an open house sometime as it is an eye-opener. I also was surprised that WY had shadow days prior to acceptance. Speaking of lunches, I was on vacation when this item hit the news, so forgive me if it was discussed already on CPSO, but did you see that starting in fall, ALL CPS students will be able to get free breakfasts and lunches? The level of poverty in a school was always “measured” by the percentage of kids who qualified for free or reduced-price lunches, so now that the process of applying for that will be obsolete, I wonder how CPS will measure levels of poverty? From what I understand, the period between 1954-early 80s there was a decrease in the achievement gap, but things have stalled (or by some measure become worse) since then. As I mentioned, there are examples (ETHS and OPRF HS, and their corresponding K-8 feeder schools) that seem to offer a good mix of black and white kids, low-income and non-low-income (nearly 40% if kids at ETHS are low-income), but this hasn’t done much in terms of eliminating the achievement gap at these racially and economically integrated schools. Don’t get me wrong, I’m all for integration, it’s just that I don’t believe that it is a “magic bullet” for solving the achievement gap, although it may help in many cases, I’m sure. I understand re: school funding. I guess I was trying to make a point to counter what I often hear which is in many ways a myth: all mostly-white suburban schools get so, so much more funding per student than Chicago. Avoca SD 37 (2 schools) benefits from commercial real estate. Wilmette SD 39 (which is 6 schools, including the bigger homes near the lake) doesn’t have much commercial real estate. This is what I’ve been told by somebody that lives in Wilmette as an explanation of why the (visibly wealthier area of bigger homes closer to the lake) than the part of Wilmette with more small homes, condo, etc. Also, North Shore school districts get hardly anything from the state or fed,, compared to Chicago. Sometimes when there are people complaining about the state’s “inequitable” funding, I think that they forget that the state’s giving hardly anything to schools in Wilmette, Glencoe, etc. Using the proverbial “New Trier as gold standard”: NT’s funding is 95.7% local, 3% state and 1.3% federal. The state and fed are already spending way more to send kids to school in Chicago than in Wilmette or Glencoe.. In theory, we could just tax ourselves at North Shore-type levels (talk to pretty much any homeowner in Evanston and often their biggest gripe is the high property taxes) and have more to spend per student. Neuqua Valley HS in Naperville (Indian Prairie CUSD 204 –one of my best friend’s kids go there and they love it) spends $6,825 in inst. and $10,575 in op’s –significantly less than CPS. Also, there the example of Thornton Twp HS 205 district (the one that serves 9-12 in Harvey, Dalton, –where the one student in the doc was hoping to avoid by moving in with his dad in Chicago for CPS SEHS). It spends $11,467 per student in instruction and $18,359 in op’s –way more than Neuqua Valley, but I think 99.9% of people on this site would rather their kids go to Neuqua Valley for HS (I know that I sure as heck would). . I have a friend who’s a SPED teacher in the Thornton Twp HS district –it pays teachers really well, they have great health benefits (“second to none” per her mouth), etc., total compensation comparable and usually better than most “good school” suburban districts, according to her [ checked online and it seems true -staring salaries are several thousand more than OPRF, for example]), so it’s not like teachers have it worse in terms of pay and benefits, so only the bottom-of-the-barrel people are teaching there. Still, for all the greater spending per student, the HSs in that district are still some of the worst performing in the state. The student in the doc moved in with his dad in Chicago to avoid going to HS there. Again, I’m not saying money doesn’t matter, simply that it’s certainly not everything –and for sure no guarantee as a basis of academic achievement for students, reducing the achievement gap, etc. I’d bet good money that if one asked 100 local parents “Where do you think schools get more money per student for HS: Naperville or Harvey?”, per the “low income, minority districts are screwed next to middle-class, mostly white ones” mantra (which I hear very often in discussions re: education, the achievement gap, etc.) most people would say, “Well, Naperville, of course, everybody knows low-income minority schools are underfunded.” But they’s be wrong, by quite a wide margin. Just as an example. I find what I consider to be sales pitches cloaked as relevant commentary by Chicago School GPS to be offensive. Unless all of you “services” are free, then I apologize. I think we all know why some school have kids with higher ability than others. But it doesn’t matter, because this city and state are bankrupt so forget about any extra money (not that it has helped before). Kim it is important to realize how the pension pick up for suburban districts is different for all other districts than CPS. For CPS its part of operating expenses for all others its picked up 100% by the state. So CPS actual operational spending per student are lower than what they appear on the report cards if we compare them to suburban districts. Somewhere in the current CPS budget they have the average cost per child of the pension pick up with the 50k given to CPS by the state for pensions taken out. I had no idea that pensions for suburban teachers were picked up entirely by the state. Rod, does that mean that suburban teachers don’t pay into their own pensions the way CPS teachers do or just that the districts don’t contribute? I wonder if this is why suburban districts always appear better funded, or at least look like more money is going into them. (I interviewed in one suburb where, I kid you not, the staff restrooms had granite countertops!!!) Things are in such bad financial shape statewide, I’ve heard you often say that there’ll be tax increases and serious austerity measures, which I believe will be the case. I’d imagine that eventually, suburban schools will have to fund most or all of their own pensions and CPS will (and other poverty districts) will lose most or all of its poverty funds. More taxes, larger class sizes, less services. My former CPS principal was really pushing every teacher to get either their ESL or bilingual certificate saying this was going to be a state mandate soon for all teachers. However, I emailed ISBE and they said that was not true, but that principals can cut all their bilingual pull out and push in positions and simply hire classroom teachers with the certificate and then that teacher has to service bilingual kids alone. It would save a lot of money, for sure. I keep waiting for the day when everyone is strong armed into getting a sped degree and there are no more pull out/push in sped teachers and the gen. ed teachers have to do it all. I hope to be out of teaching by that time, but if not, at least my kids will be out of school. @32 Rod, Thank you for pointing that out about the difference between the pension pick up in CPS vs. suburban districts. Do people realize the pension obligation that is supposedly bankrupting the system is also REVENUE problem? And yes, while $ is not the complete and total answer, the solution to the achievement gap,it is also not as simple as, golly gee, the disadvantaged just need to pull themselves up by their boot straps, and their teachers just need to roll up their sleeves and get to work. 2/3 of the corporations in this state have income tax sweetheart deals. We are told by the media that it is those greedy, bloodsucking teachers that are bankrupting the city.We have a flat 5% income tax. Even though this does not directly impact CPS funding, because it is not property tax; it indirectly affects education funding and the stress upon working families. Raise the minimum wage and maybe, just maybe, one parent can stay home, and make eye contact with the kids for more than an hour while talking to them not while not exhausted and crabby, and increase their vocabulary, stimulate their minds, and increase their school readiness before CPS even gets them at age 5. The achievement gap is so related to larger national issues of economic inequality. I only had time right now to watch Episode 8. Watching that first family open the letter brought me back to last Spring. Yup, I cried just as hard with the same emotion as I watched him open and read his letter. The anxiety is overwhelming. Depressing that the Young principal states her school is “for kids who want to learn, who want to be successful in life, who want to go to college.” I didn’t realize that 14 year olds fit into two categories -those who want to learn and those who don’t. I also thought that it is the job of educators to ignite the fire in kids for learning…but apparently I’m wrong. I agree with the Young principal. I think it’s like that at PJN also. I don’t think a student entering hs would survive one of the the 4 schools if their goal wasn’t to learn, be successful & want to go to college. These 4 SEHS teachers ignite the fire to keep learning. @22 Thank you. You are correct. The figure for SY14-15 should be $31,005 for a family of four (130% of $23,850, which is the poverty line for a family of 4). So my @21 should state that if your family of 4 makes $31,006, you only get a reduced student lunch. @29 Aside from pensions that Rod mentions, keep in mind that, compared to Indian Prairie, CPS has 4x the homelessness rate and over 3x the EL rate, so the costs for those programs must be factored in. Compare that figure to figure 2 for NJ, which underwent major school funding reform in the late 1990s through to 2008 in order to get more funding to high poverty school districts. IL could better equalize funding to high-poverty areas without increasing state spending on education. Thank you for bringing this excellent series to our attention CPSO. I liked that they included the suburban girl who was not going through the CPS process, it was a gentle reminder to us obsessed parents that going to HS is an exciting and nerve-wracking time even if you are not experiencing the CPS choice model. What a great bunch of kids. Also found the comparison of the five different elementary schools, including three different types in Chicago, to be very interesting. Finally finished watching. Great insight, thanks for posting. I think some of these school counselors need to start reading CPSO. Why would they suggest ranking schools based solely upon score. The girl who got into Westinghouse had nothing to lose by ranking Lane first and could have possibly lost out on Lane if she qualified. I was most impressed by the dynamics of all 5 schools seeing all positive environments. Good to see. Lots of technology at all schools – another good thing. @27 – Sounds like really helpful information to me. These videos illustrate that. People continually need help navigating the system. It was interesting that when asked if it really matters about which high school you attended, none of the 4 felt that the neighborhood was an option. If the teachers cared about the children, they would lower their pay and benefits to reasonable levels and direct those funds to educating the kids. Plus with the illegals flooding this country there will be even less funds on a per student basis for the American children. This state and city is broke. Next stop, Federal Bankruptcy court where the state constitution means nothing as Detroit is finding out. Let’s do the reverse on you, Tia W.
If you care about your child and the children of the city, you will launch an effort to pay more taxes out of your own pocket. Since financial sacrifice = caring for you, you should have no issue with that. Never mind about your other responsibilities, bills, etc. I am not convinced at all by this discussion about why white/non LI students may be better of staying in CPS than moving to suburbs like Wilmette, etc. If white students of a certain income level can be guaranteed a spot it a “good” suburban school, why go through the gymnastics of cps application process and possible boundary shifting (especially if you have multiple children) when you can just be “guaranteed” a spot in a school where people of the same race and income level do just as well as coveted and competitive CPS spots? Many people do in fact do the numbers break down and see that white and non-LI students do the same as or better than those in CPS but still opt out not only for the for the sense of relative educational security, a well rounded education (music, language, art, etc) and more space for less money in their homes. On another note, I am troubled by this constant conflation of race, class, and ethnicity among blacks in discussions like this. This conflation is very ill informed and detrimental. Not all blacks in this country (and Chicagoland to boot) are African American, impoverished and/or in the achievement gap. For example, the children of African and Caribbean immigrant children have continually outperformed even whites with high SES ion standardized test scores and in school. This fact has been documented for decades. Although she used this fact in a problematic way, controversial “tiger mom” Amy Chua brought this fact out of academic circles to a wider public in her last two books. KLM, you have a lot of great posts and share some very useful information on this site, I hope you don’t see this as an attack, but you don’t get a pass on this kind of conflation simply because you are a white parent to children you/society label as black . You are not the only one that does this in discussions like this, but you are quite over with it on this thread. Re: the achevement gap between persisting for *some* black students despite income level, it is not difficult IMO to understand why there would be one. Contrary to popular belief, we don’t live in a post-racial society. Is anyone really surprised that race can have a negative impact on black (and brown) students even if they have the same economic background as whites? In a world where and white males with a high school education are more likely to be hired than an African American male with a graduate degree, it is not too much of a stretch to think that racial bias by teachers and administrators (regardless of race the teachers’/administrators’ race) can influence the experiences of black students. I would also point folks to the field of social psychology for those who are interested in the persistent gap among African Americans and whites (regardless of income level). “Stereotype threat” effect, first documented by psychologist Claude Steele in the 1990s, has been replicated numerous times since then and used as evidence to uphold affirmative action in the 2003 Grutter case. Basically, black and latino students will 1) do worse than white students; OR 2) perform the same or better than white students on the exact same standardized test (SAT, ACT, etc) depending on whether the groups of students were aware they were taking an exam minorities are statistically expected not to do well in. Interestingly enough white kids also scored significantly higher on the exam in situations where minority students did worse. This is corollary phenomenon called “stereotype lift.” This boost in white student performance disappeared if they were not aware they were taking an exam where an achievement gap was expected. I didn’t understand why the young lady from New Trier was on the documentary. What was the point?